Helpers!, originally uploaded by Michael A. Lowry. With the help of six friends, loading the truck took less tuan two hours. Thanks to Simon, Kirsten, Jonas, Mirja, Carl-Johan, and Gregory for all their help! 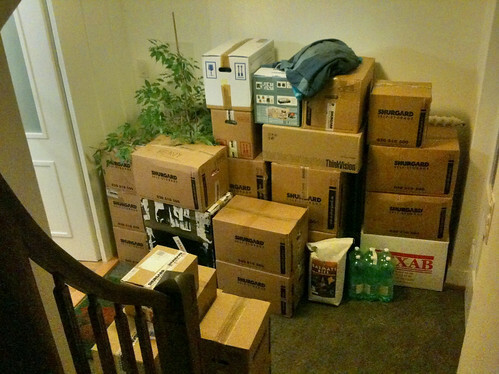 Lots of boxes, originally uploaded by Michael A. Lowry. Packing the “last few things” took a lot longer than I expected. I’m glad I “finished packing” last night so that I had another evening to do all the things I didn’t think would take any time. I still have a few odds and ends to toss into boxes or bags tomorrow; but I’m hoping that can be done on-the-fly. We shall see. I’ll pick up the truck at Hertz around 9 tomorrow morning. My friends and I will begin loading the truck at 10, and I hope to be able to get most of it done within two hours. The ride to Wollishofen should take no more than 15 minutes; and then the job of unloading will begin. I have guests staying over at my new place tomorrow night, so I hope I can at least find a few necessary items in the boxes during the afternoon. OK, I gotta get some sleep or I’ll be dead in the morning. Over and out. Tonight I’m at Minimum for the first time in a couple of months. I’ve “buddy-taped” my fingers together. We’ll see how it goes! Juan Williams was fired from NPR for stating that seeing Muslim people on an airplane made him nervous. His comment surely resonated with many Americans, an erstwhile diverse and freedom-minded bunch of people, who have nonetheless fallen victim in recent years to a propaganda campaign of fear. 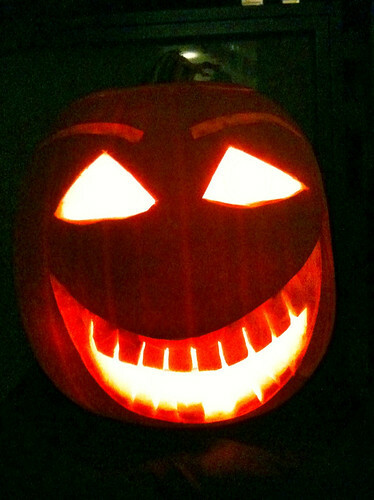 Americans these days can be a twitchy folk, easily made nervous by people who are different. If many Americans are made nervous by Muslims, then the neocons at FOX News are to blame for spreading fear rather than understanding. A reporter’s duty is to report facts, not to stoke fears. At best, Williams’ comment and his unapologetic defense since then show an insensitivity toward Muslim Americans; at worst, they expose a deliberate and self-serving ploy to improve his salary by moving to FOX. That’s where all the other fear mongers are, after all. The fear mongers have always found a group of others, to stoke fears and control public opinion. It was not too many years ago that the average American would have been nervous upon meeting a black person on the street. If Mr. Williams is aware of the irony of his position, he has hidden it well. My left index finger, originally uploaded by Michael A. Lowry. On Monday I visited the hand clinic at Balgrist, just a few minute’s walk from my home in Zollikon. There I saw Dr. Schweizer, who examined my finger and came to the same diagnosis that I had suspected: partial rupture of the left collateral ligament of the proximal interphalangeal (PIP) joint of my left index finger. This ligament is the main thing that prevents the finger from bending sideways toward the thumb, so it’s pretty important. In the upper radiograph, above, the damaged ligament would appear just above the joint in the center of the photograph. You cannot see it in this picture because soft tissues like muscles, tendons, and ligaments do not show up well in x-ray photos. 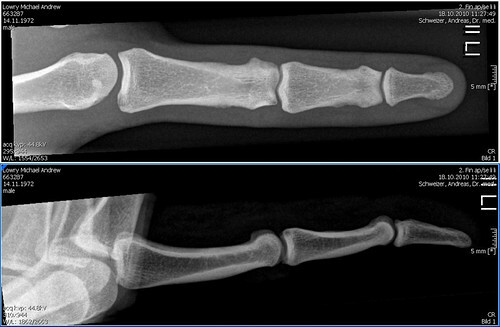 This is a top-down view, so that ligament lies on the left side of my left index finger. I sustained this injury while working on a particularly difficult bouldering problem at Minimum, back in the beginning of August. It happened when I held a crimpy grip with my left hand and rolled the fingers counterclockwise to give myself a bit more reach to the right. With the weight bearing down sideways on my fingers, the collateral ligaments bore more than their usual share of the load. Dr. Schweizer gave me some little strips to use to affix my index finger to my middle finger, limiting its mobility, and all but eliminating the possibility of oblique forces that might cause further damage to the ligament. 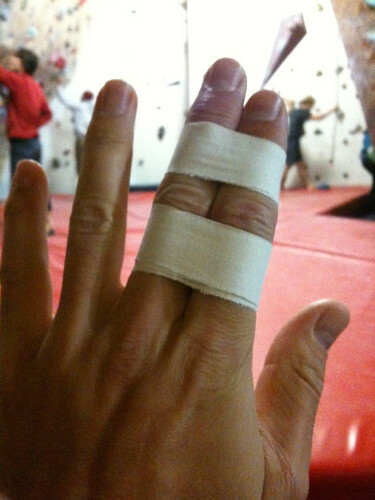 Two months of rest are called for, along with daily exercises to maintain and restore the finger’s range of motion. I may climb, but only if I completely avoid using my left index finger, or if I tape my index and middle fingers together tightly and avoid sideways loads. The prognosis a full recovery in time. After two years sharing Gordana & Andrew’s beautiful home in Zollikon, I have made the decision to move to the other side of the lake. It was a difficult decision, but I am confident that it was the correct one. 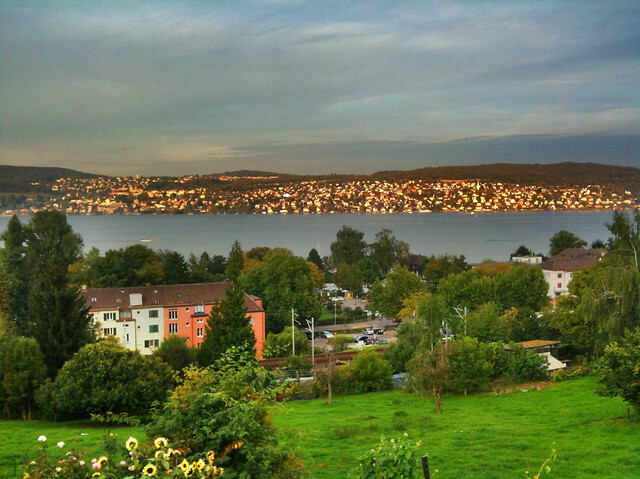 My new apartment is located in Wollishofen, in a part of the city of Zürich known as Kreis 2. It’s just north of Kilchberg, the neighboring town to the south. The IBM Research lab where I work is located just a bit further south, in Rüschlikon. So I will live about halfway between my workplace and the city. This means I’ll be able to stop by home after work, freshen up or grab a bite to eat, and then head into the city to meet friends. My new place is also just five minutes’ walk from the lake, ten minutes’ bike ride from Nordiska & Minimum, and about fifteen minutes from IBM by bus or bike. The view from my the street near my new home; my view is a bit less spectacular, but still pretty good! 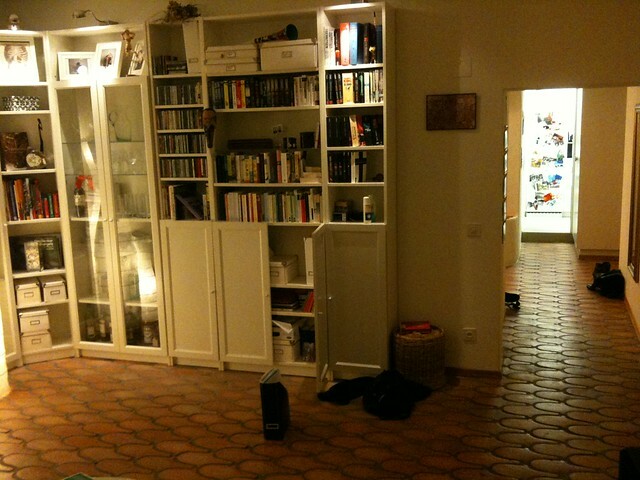 The house is situated about halfway between Wollishofen and Kilchberg train stations. Being a ways from the stations will be a bit inconvenient, but a disadvantage of living nearby a station would be that I would hear the screeching of brakes as the trains pulled in. Where I’ll live, the trains pass quickly by. I will probably buy a car in the next couple of weeks. A car will come in handy during the move, and will make shopping for groceries easier in the future. Plus, I’ve been thinking about getting a car for a while now. I miss having the freedom just to hop in behind the wheel and head out at a moment’s notice. Having a car also means I can take more stuff with me when going skiing, hiking, climbing, and so on. The flat is in the basement of a big old house on a grassy hillside overlooking the lake. It’s on the back side of the house, away from the street and facing the lake. I have my own entrances into the bedroom and living room. The outside door from the living room opens onto a private terrace and a large garden I will share with the other families in the house. There are fruit trees and berry bushes in the garden, and grape vines covering the pergola over the terrace. The place is relatively quiet despite being quite close to the train tracks. The tracks are about a hundred meters away, but down a steep hill and on the other side of a bunch of trees. The kitchen is tiny, but the dining room and living room are quite big, and have windows facing the lake. 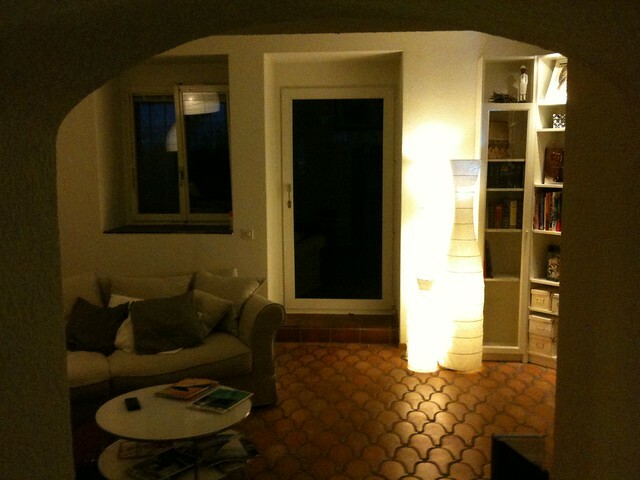 There is terra cotta tile throughout the apartment, with floor heating underneath. I’ll have morning sun coming in the window of my bedroom. The house includes a sauna, in the common area just outside my front door. The washer and dryer are also in this shared area, and there is also another shared bathroom there, as well as a bench for lying down and relaxing after a stint in the sauna. This relaxation room has a window and a door leading out into the garden. Big sauna fan that I am, I’m sure I will appreciate this perk—especially in the winter months. Now I have my work cut out for me. I’ll get the keys on Tuesday the 26th, and will do the big move on Saturday the 30th. Between now and then, I have to pack up all my things, rent a truck, and enlist the help of friends for the move. I will also try to take advantage of the truck to pick up a few pieces of furniture. In my current apartment, I have just one piece of furniture (my bed), so I’ll need to buy all new stuff for the new place: a kitchen table & chairs, bookshelves, a sofa and coffee table, and lots of lights and lamps. Eventually I’ll probably also get a TV and surround-sound audio system. But honestly—I haven’t watched TV in months, and even if I do decide I want a TV, I can always watch on my computer in the meantime. If you’re free on the 30th, and will be in Zürich, please set aside some time to help out with the move. I will offer beer and pizza to all who help!